This section covers explaining License, DirectAdmin values and updating DirectAdmin Version/ License. 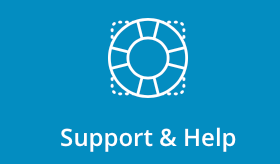 To access DirectAdmin licensing and/or updates, sign into the control panel and then click on the "Support & Help" icon, followed by the "Licensing/ Upadtes" link. You will see a table, which will provide detailed information about your DirectAdmin and License status. This is the IP address that the license is assigned to. The license will only work on that IP address. This is the name you selected when you ordered the license. This is the license ID generated by our licensing system. It helps us keep track of all licenses. This is the login ID of your DirectAdmin client account. This is type of license you are aquired with. This is beginning date of the license file. For example, a license for the month of May would be Valid After May 1 00:00 and Valid Until May 31 23:59:59. This is the expiry date of the license. For example, a license for the month of May would be Valid After May 1 00:00 and Valid Until May 31 23:59:59. The license file will be automatically updated before expiry. Portioned License is a license that has a true expiry at a date further into the future than is set in the physical key. The license will automatically update to the next time period when the key's expiry nears. This is the time according to the server. License creation and expiry depends on the server time being set accurately. Please ensure the time is accurate for your time zone, or your license may stop working unexpectedly. 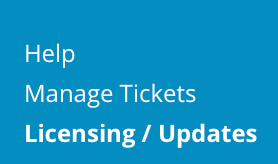 This is the amount of time remaining before your license expires. The license file will be automatically updated before expiry. This is the time the license file was last updated on your server. This is the OS version DirectAdmin was compiled on. This is the date DirectAdmin was compiled on. This is the version of DirectAdmin that is installed on your server. This is the most recent version of DirectAdmin. Unless you are using a lifetime license, your Server Version should match the Current Available Version. If it doesn't, click the "Update DirectAdmin" button. This is the time when the copy of DirectAdmin on your server was last updated. This is the time then DirectAdmin on your server was last restarted. DirectAdmin is designed to automatically update when a new version is released. Your license file is automatically updated approximately 1-3 days before expiry. If you need to manually update, you can always click the "Update License" and "Update DirectAdmin" buttons.